The Apex Beam CK2000 is a tactical flashlight that recently launched online through a special offer. Find out everything you need to know about the Apex Beam CK2000 today in our review. The ApexBeam CK2000 is a tactical flashlight that comes with its own rugged case. The flashlight, at first glance, looks identical to every other tactical flashlight sold online in recent months. It features a beveled edge, zooming functionality, and different modes. It’s called a “tactical” flashlight because it has a slightly-heavier weight than an ordinary flashlight. The beveled edge around the light can also be used for self-defense – although if you’re close enough to use a flashlight as a hand-to-hand weapon, a beveled edge probably isn’t going to save you. Does the CK2000 have enough to distinguish itself from the $20 to $30 tactical flashlights on Amazon? Let’s take a look at its features. In terms of brightness, the CK2000 is called the CK2000 because it offers over 2000+ lux of light output. Typically, tactical flashlights measure their brightness in lumens – not lux. Lumens is a measurement of light known as luminous flux, while lux is a unit of light measurement that takes the area into account, so it’s best described as light intensity. The CK2000 likely uses the same bulb seen on tactical flashlights on Amazon. It’s called the XM-L T6 Led. It outputs 2000 lumens of luminous flux (lumens), although the specific “lux” varies depending on your zoom. It’s unclear if the Apex Beam CK2000 measured lux at the 1x zoom or 2000x zoom. In any case, Amazon’s XM-L T6 LED tactical flashlights are sold for as little as $15 to $20. So how does the Apex Beam CK2000’s pricing compare? As you can see, the price per flashlight never drops below $29.99 per unit. 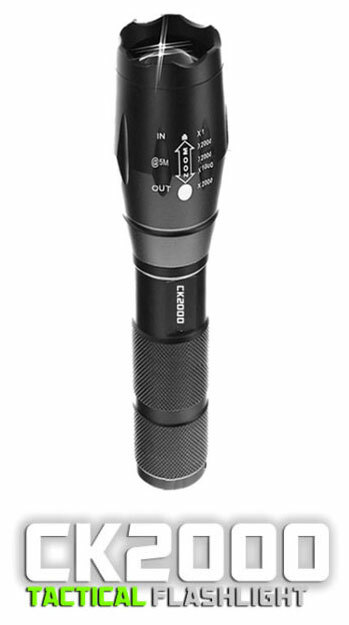 Considering similar units sell on Amazon for $15 to $20, it seems like you’re paying a premium for Apex Beam CK2000 even when you buy 5 or 10 flashlights at a time. If you’re only buying 1 flashlight, then it’s surprisingly pricey. However, in defense of the Apex Beam CK2000’s pricing, you do get a tactical carrying case. What’s Included with your ApexBeam CK2000? Your Apex Beam CK2000 includes a “tactical case”. That case comes with a holder for your flashlight and its accessories, all of which are included in your purchase price. The tactical case is made out of aluminum. These features, according to the makers of the Apex Beam CK2000, make the flashlight ideal for hunting, fishing, camping, and other outdoor activities. 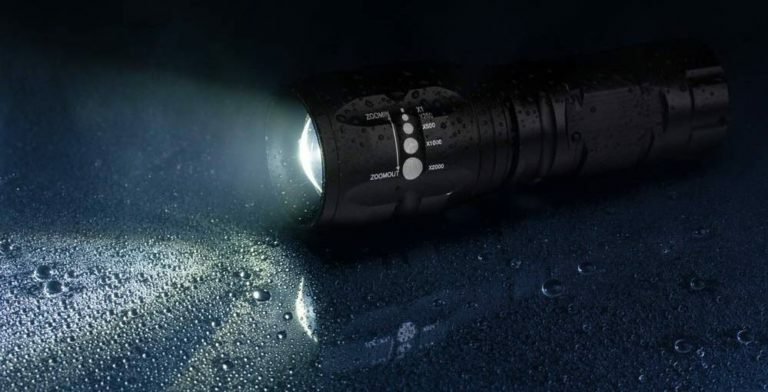 They also recommend the flashlight for military and law enforcement personnel (although typically, military and police officers will want a flashlight that’s more than IP65 certified). Who Makes the Apex Beam CK2000? The Apex Beam CK2000 is made by a company named Apexbeam LLC. A quick search on Google Maps doesn’t appear to show any flashlight manufacturer in the area. Instead, there’s a pain management clinic called Apex Pain Specialists. It’s unclear if they’re connected to the Apexbeam LLC flashlight company in any way. Apexbeam LLC doesn’t appear to be linked to any other products sold online today. Should You Buy the ApexBeam CK2000 Flashlight? Ultimately, based on the limited information about the company, Apex Beam appears to be a white-label form of another tactical flashlight product. These tactical flashlights are available all across the internet – including some for as little as $15 on Amazon. These flashlights use the same bulb as the Apex Beam CK2000 – typically the CREE XM-L LED. They all offer the same beveled edge, the same zoom functionality, and the same “aircraft grade aluminum” claims. In reality, the CK2000, like other tactical flashlights sold online today through tacky offer pages, is a medium-quality flashlight that makes big claims about its effectiveness, but fails to provide enough information to live up to its $80 price tag – especially considering you can buy virtually identical flashlights for as little as $15 to $20 from Amazon. If you buy 5 flashlights at a time, then you can lower the price to just $30 per flashlight – but who needs 5 flashlights? If the carrying case is worth the high price tag, then the CK2000 may be a good deal. Otherwise, you can find better deals in other places online.